Zuisen Hakuryu Awamori - Kampai! : Kampai! Distillery: Zuisen Distillery, Co. Ltd.
Zuisen is perhaps the largest distiller of Awamori in Okinawa. This Hakuryu represents their entry level Awamori, though they have domestic varieties that are aged for more than 20 years. Like all Awamori, this represents a full flavored spirit with a great deal of complexity. 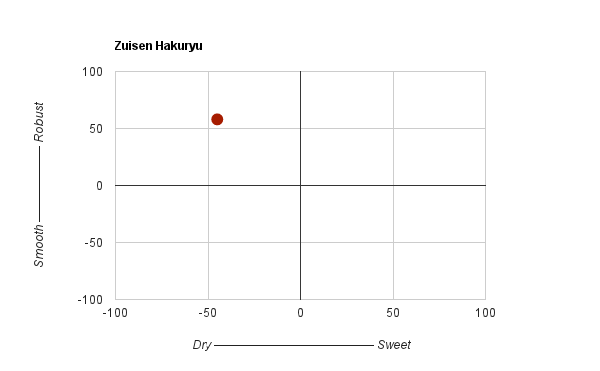 These spirits are difficult to place flavor-wise and only a molasses palate steps to the front among familiar flavors with Zuisen. Unlike other Awamori available in the U.S. this one is quite balanced. Not necessarily smooth, but mellow for the style. As with all Awamori, Zuisen ages exceptionally well if stored in a clay jar for a few weeks to months. The flavors mellow further and the nose shifts from strange and exotic to something much closer to a nice rich imo shochu. This is a mild Awamori as they go, which means its still quite a bit more flavorful than other types of shochu. This may be a nice introduction to Awamori for those who have discovered shochu and want to explore its diversity. As with all Awamori, this is probably not a spirit to make cocktails with (which won’t keep us from trying), but it is a nice drink on the rocks or with water. first let me thank you for the tasting, my first visit of a Sake distillery. I already had learned something about Sake at promotional tastings, at London Wine Trade Fair, Prowein or VINEXPO, and especially in a Japanese Bar in London that specializes in Sake wine and spirits. Now I learned about Amawori, a product made with a special yeast. I consider your 18-year old product much superior to the 10-year old and suggest to submit it to a spirits competition organized by “Selection”, a German wine & food magazine with a circulation of 60.000 in Germany, Austria and Switzerland. I am one of the tasters there and can assure you that the high circulation of this magazine promises a good impact on consumers and trade in the German speaking part of Europe, an impact probably better than the other spirits contests experienced by me in England, South Africa, Austria and Germany. I have given your email address to the organizer of the competition. He will send you the invitation and conditions for participation. I hope to find your excellent Kusu among the award winners in the future. If you’re lucky enough to find a bottle of Kawabe in New York, grab it and enjoy. It’s been consistently out of stock at every liquor store and izakaya that carries it due to unexpected demand thanks to capturing the attention of several prominent izakaya bartenders and their customers. Some bar have resorted to shipping cases from California to assure uninterrupted supply. Part of what’s fascinating about exploring shochu is that each distiller has their own approach to reaching flavor. The general rule is that if you want a smooth, mellow shochu you look for a shochu made with low pressure distillation and white koji. That combination is going to give you a very mellow shochu no matter what base grain is used. Conversely, a black koji and atmospheric distillation shochu is going to maximize flavors, create all sorts of complexity that many drinkers either love or hate. Where things start to get very interesting are in the middle. Kuratake surprised me as soon as I opened the bottle. The rich sweet potato aroma and flavor I expect from imo shochus is largely absent from this spirit until you pay attention. It’s got a subtle presence, but not the overwhelming sensation you’ll get from a traditional Kagoshima style black koji imo shochu like Shiranami Kuro. This shochu takes the experience in a completely different direction.